Regional De Nora office in Abu Dhabi recognized for parts availability, timeliness, and service for multi-site chlorine dioxide generator maintenance agreement. Dubai Electricity Water Authority (DEWA) recognized De Nora, a leading company in safe, innovative and sustainable solutions for water disinfection and oxidation, filtration and the production of sodium hypochlorite(NaOCl), in a ceremony honoring its best suppliers. The event was held by DEWA as part of the 20th edition of the Water, Energy Technology and Environment Exhibition (WETEX). Thirty-five (35) suppliers were recognized including Siemens, ABB, Dubai Cable Company (Private) Limited (Ducab) and E&H in line with the results of the 2017 performance appraisal. As one of the main suppliers in its field, De Nora was selected among the best suppliers to DEWA due to its factory service level, provision of spare parts, responsiveness, updated monthly reports and the level of technical support provided by De Nora. De Nora has supplied chlorine dioxide generators since 2011, at three main installations: Mushrif Reservoir, Ghafat Reservoir, and Lussaily Reservoir. Annual service contracts include servicing and maintaining the chlorine dioxide systems with weekly visits, preventive maintenance, quarterly maintenance, and emergency service as needed. 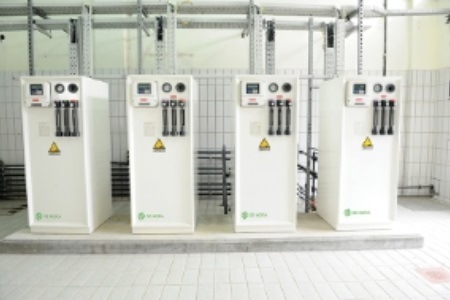 De Nora chlorine dioxide generators ensure efficient solution production, precise solution feeding, low maintenance and dependable operation for the life of the equipment. De Nora systems maintain a product yield greater than 95%, and are available with either manual or auto control and feature system shut-down and alarm options. De Nora is committed to delivering customer satisfaction and ensuring safety, resulting in continuous improvements in the products and solutions offered.